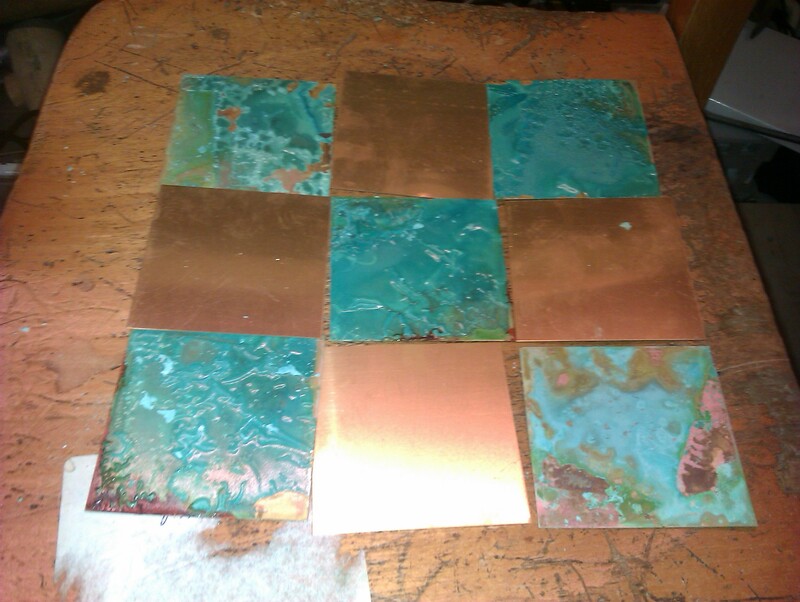 I’m going to adapt the ‘Stepped’ effect using brass squares, 3in by 3in on a side with polished brass for the white squares and a Verdigris brass effect for the black squares. I bought a pattination fluid (designed to make your brass/bronze garden ornaments go green). 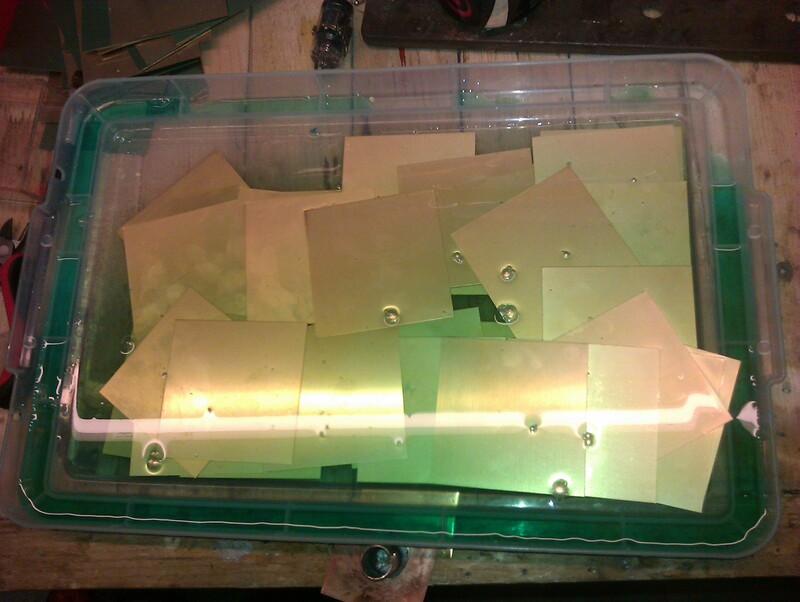 I was annoyed to find that it is just neat copper nitrate solution – copper sulphate would work just as well and I’ve got loads of that from my electrolytic brass etching projects. So i just gave them a soak in the solution for an hour, left them to dry without rinsing them and then laid them out overnight for the Verdigris process to work. I need to solder copper pipes to the bottom of every square but I also need to seal in the pattination otherwise it just flakes off. I managed to find some heat resistant lacquer from a car parts shop, meant to coat engine bays in performance cars so that did nicely to make a permanent effect of the verdigris and allows me to use a gas torch to solder the pipes onto each square (not started that yet) without the lacquer melting. So you get the general idea, the whole board is 2ftx2ft so very oversized and each individual square will be elevated, level on its post but at a different height to it’s neighbours and hopefully forming a gradual slope up to the corners. 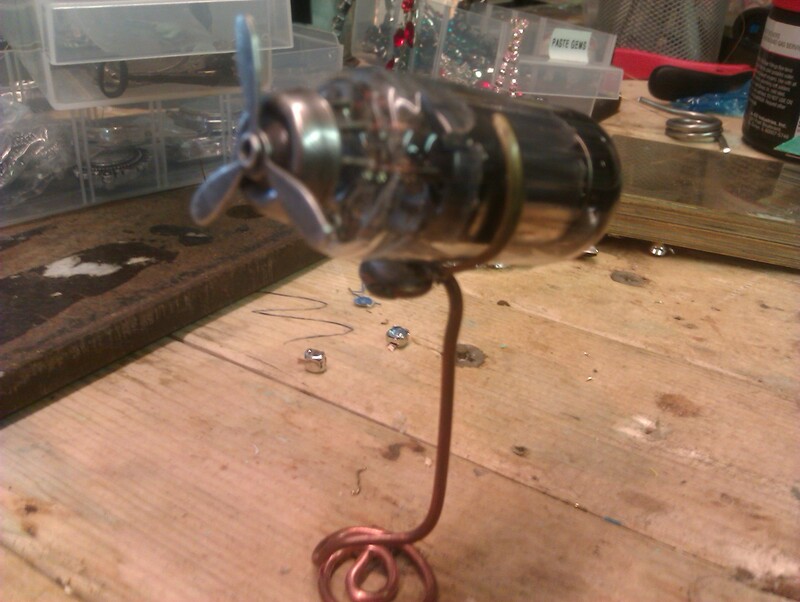 This is a prototype of one of the white pawns, using an antique radio valve as I’ve got loads of them. They are supposed to be dirigibles. The coil of copper at the base will be neater, and will also be embedded in resin to make a nice regular base for these. 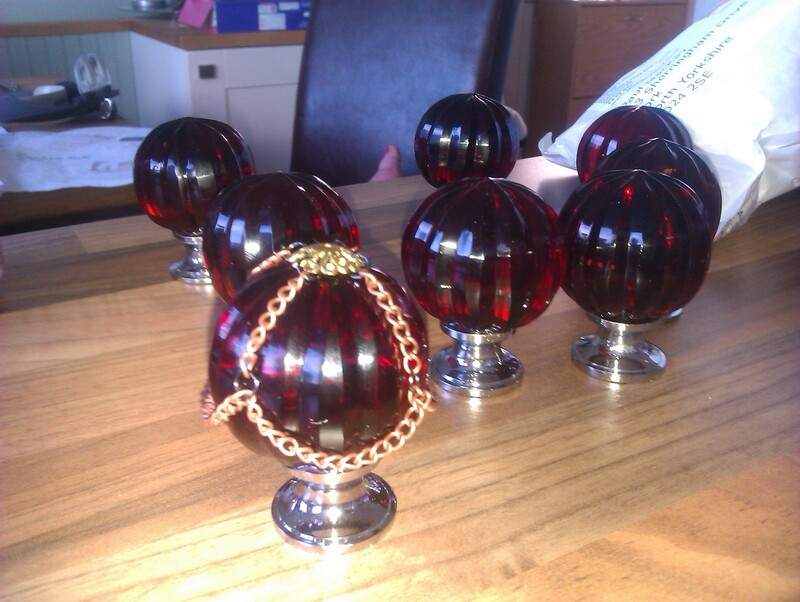 These will be the black pawns – a lovely glass doorknob, with added chain detail that needs a bit of tidying up. They will sit on a base of air dried clay, painted and varnished to look similar to the original Montgolfier brothers balloon I think. So its kind of a Dirigibles vs. Balloons theme. 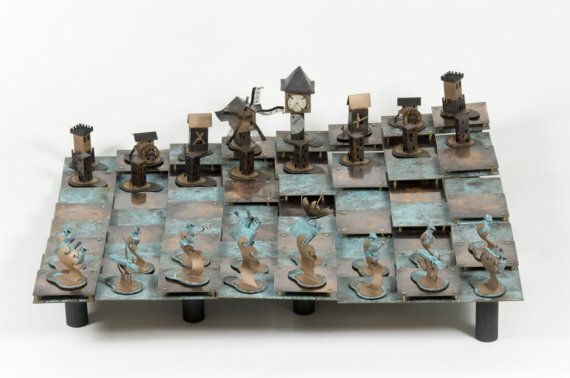 The rest of the pieces are likely to be made of clay and will represent genres and themes within Steampunk but it’s really, really tempting to make the characters people I know from the scene – Major Tinker as the King perhaps?? Dr. Geof as a bishop???. Once I’ve finished the board, I will move on to them. DV8 takes place this weekend in York, I will be trading in the market in the Park Inn Radisson hotel on Saturday 23/7/2011. The usual collection will be on show though I have acquired some of the Colonel Fizziwig resin blasters that appeal to the LARP crowd who are always likely to turn up. They are priced quite competitively. I know it evades my handmade ethos but to be honest, I need to have something for the lads while Madame browses my wares. This entry was posted on July 22, 2011 at 10:13 am and is filed under Uncategorized. You can follow any responses to this entry through the RSS 2.0 feed. You can leave a response, or trackback from your own site. I have a Steampunk event coming up August 27th and wondered if you would be interested in displaying/selling your wares? You can find me on Facebook under Gully’s Angels Steampunk Spectacular or email me.